I am Truth. I am Knowledge. I am Healing. Hilarion was a High Priest in the temple of Truth in Atlantis and later helped to establish the oracles of Delphi in Greece. In another life he was Apostle Paul. In his last incarnation as St. Hilarion he was a great healer and founder of the Monasticism in Palestine. Master Hilarion is holder of the Green Flame and Cohan of the 5th Ray. He helps with the healing sciences, sacred geometry and above all – the divine Truth. Since the year 2000 Master Hilarion has begun working to stop the excessive over consumption and over farming of our planet. This must stop now and we must become conscious of what we consume, what we feel, what we acknowledge and what we release. Herbalists, along with others including hands on healing, naturopathy, homeopathy, acupuncture and reflexology will continue to grow. Consuming food is about the resource for the physical form and it also supports the spiritual form as we all know. Purification is important. Drinking water and eating well are important. Hilarion is working to bring people back to a healthy lifestyle of vegetables and fruit to nurture and nourish the body. 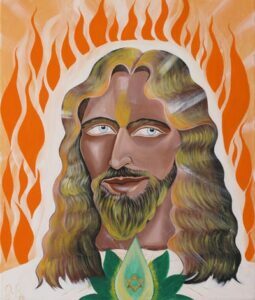 The painting shows Master Hilarion with the Green Flame in the Lotus. Within the Lotus is the six pointed star, an ancient geometry symbol of healing. The yellow to orange colours are the higher consciousness.